Our operators are OSHA certified riggers & NCCCO approved. Our cranes are fully computerized and tell our operators exactly the amount of weight they are lifting, how far out the boom is extended, and what is our boom angle. We sell reverse camera systems for Auto, Truck & Bus applications. If you would like to install it yourself or have us install it for you. We can give you an estimate up front & let you know you costs prior to doing the job. We pride ourselves in customer service & we work hard to ensure we provide the best customer experience. If you have some time & appreciated any of our services, please leave us a review. We appreciate & value your feedback. We provide service to the entire island of Oahu. We provide all types of towing from Small Vehicles, Class 6,7,8 tractors, to airplanes. Our business is here to help you in your times of need. Contact us Today for Estimate! Time after time, we're able to do what no other company can do, not only because of the equipment we operate, but because of the highly trained, experienced, and certified technicians and operators. All our operators are CTTA & WreckMaster certified. WE NOW DO ONLINE RESERVATIONS FOR TOW! CLICK HERE TO GET STARTED! Devin has been in the towing industry since 1985 and has continually developed the business to grow and assist our customers in their time of need. All of our employees have attended numerous training classes here and on the mainland to learn different techniques of handling exotic and lowered vehicles. 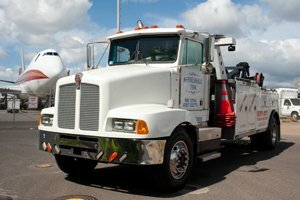 Affordable Towing Service Inc provides all types of towing from Small Vehicles, Class 6,7,8 tractors, to airplanes. Our tow trucks are built specifically as tow trucks and not as add on units. This way they are built for longevity and their specific task is to handle large vehicles when they breakdown. We are the " Home of Hawaii's Largest Tow Truck" which is 80 tons of fun. This size of a tow truck was the first in Hawaii for it's width, girth & size. Being so large and with a winching brake this truck sits still even for the most challenging of recoveries. Our drivers are trained and certified in how to properly operate our trucks so that we eliminate all the possibilities of human error entering the equation when you call for towing or recovery service. Granted you cannot overrule " MURPHY " law but we use it to our advantage with additional rigging or trucks. Our light duty tow trucks are state of the art and equipped with all the equipment necessary to get the job done the first time. Our trucks are state of the art and have the comfort of home with A/C & tinted windows for our customers comfort. Our operators are full uniformed with steel toe shows, long pants, company safety shirt, safety vest, gloves & hard hat (when necessary). They are able to bring out fuel, change flat tires, unlock your vehicle, and provide winchouts of vehicles mired in mud, sand, grass, etc. Low Pressure Air Cushions are used in a variety of different tasks i.e. The above is done with less then 7 PSI of air pressure.